To identify the questionnaires used to assess refractive surgery outcomes, assess the available questionnaires in regard to their psychometric properties, validity, and reliability, and evaluate the performance of the available questionnaires in measuring refractive surgery outcomes. 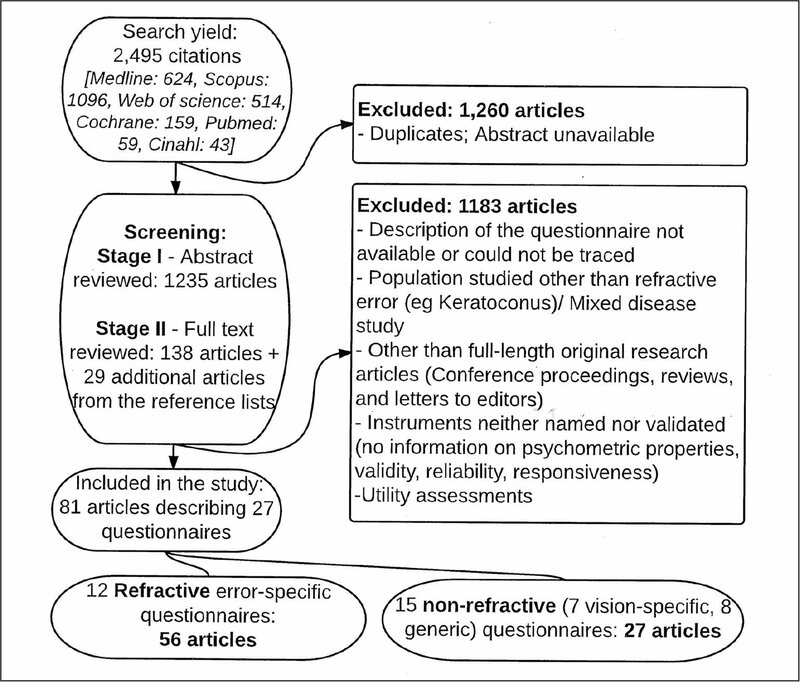 An extensive literature search was done on PubMed, MEDLINE, Scopus, CINAHL, Cochrane, and Web of Science databases to identify articles that described or used at least one questionnaire to assess refractive surgery outcomes. The information on content quality, validity, reliability, responsiveness, and psychometric properties was extracted and analyzed based on an extensive set of quality criteria. 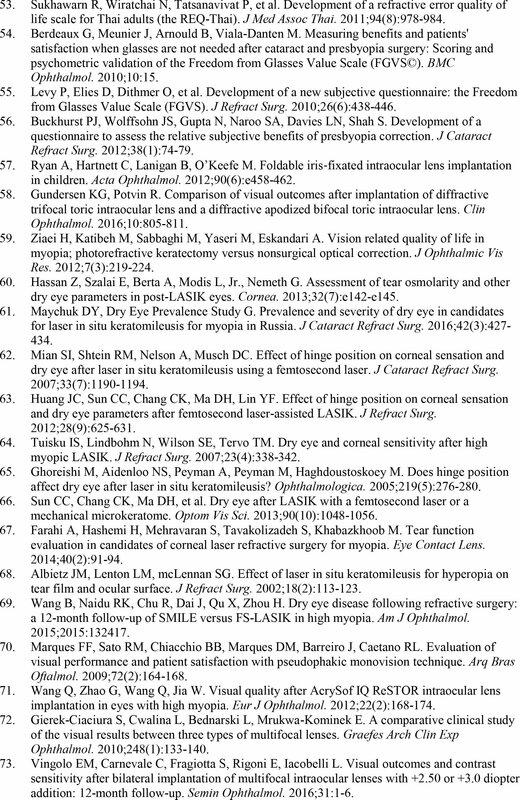 Eighty-one articles describing 27 questionnaires (12 refractive error–specific, including 4 refractive surgery–specific, 7 vision-but-non-refractive, and 8 generic) were included in the review. Most articles (56, 69.1%) described refractive error–specific questionnaires. The Quality of Life Impact of Refractive Correction (QIRC), the Quality of Vision (QoV), and the Near Activity Visual Questionnaire (NAVQ) were originally constructed using Rasch analysis; others were developed using the Classical Test Theory. The National Eye Institute Refractive Quality of Life questionnaire was the most frequently used questionnaire, but it does not provide a valid measurement. The QoV, QIRC, and NAVQ are the three best existing questionnaires to assess visual symptoms, quality of life, and activity limitations, respectively. 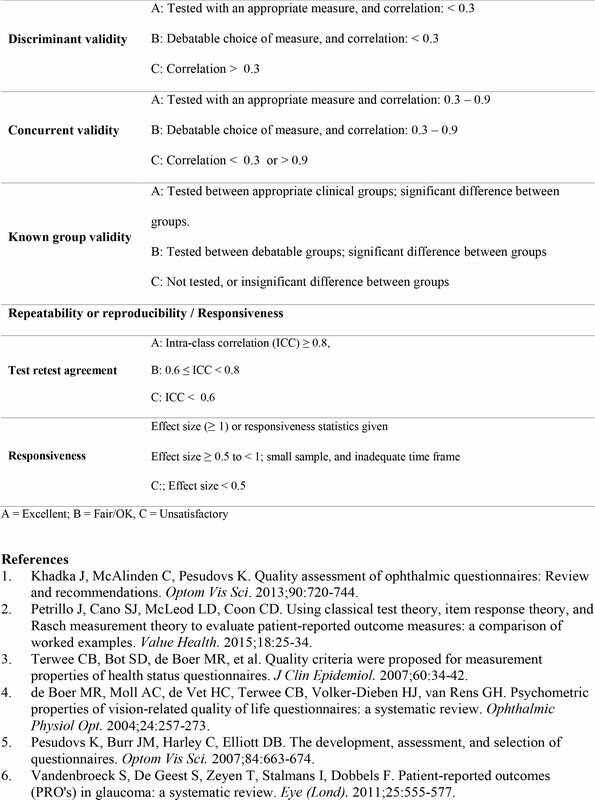 This review identified three superior quality questionnaires for measuring different aspects of quality of life in refractive surgery. Clinicians and researchers should choose a questionnaire based on the concept being measured with superior psychometric properties. The existing questionnaires specific to refractive error are not of equal standard. Moreover, the questionnaires developed to assess outcomes of spectacle wear, contact lens wear, or uncorrected refractive error may not be valid for refractive surgery. Hence, it is difficult to choose an appropriate questionnaire as a clinical or research outcome measure in refractive surgery. 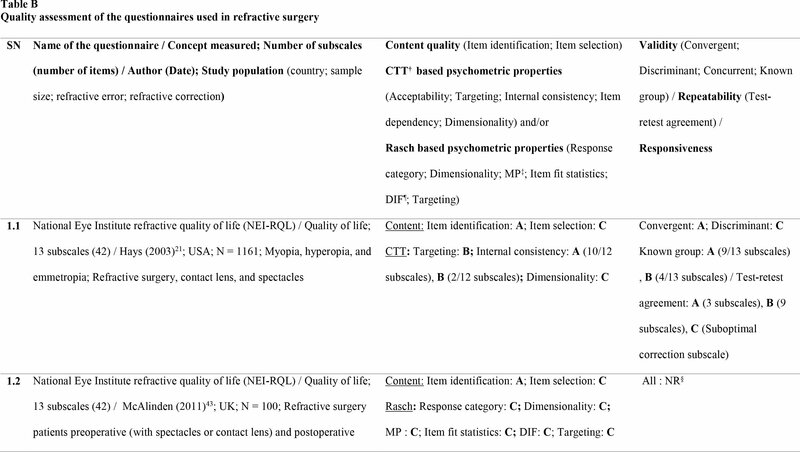 Therefore, we performed this systematic review to: (1) identify all of the available questionnaires, (2) determine quality of the existing questionnaires, and (3) evaluate performance of the questionnaires in measuring refractive surgery outcomes. The relevant articles published before June 19, 2016, were identified by an electronic search in PubMed, MEDLINE, Scopus, CINAHL, Cochrane, and Web of Science databases. The search strategy employed comprehensive search terms (Table 1). It was a systematic and iterative process limiting only to the English language (Figure 1). 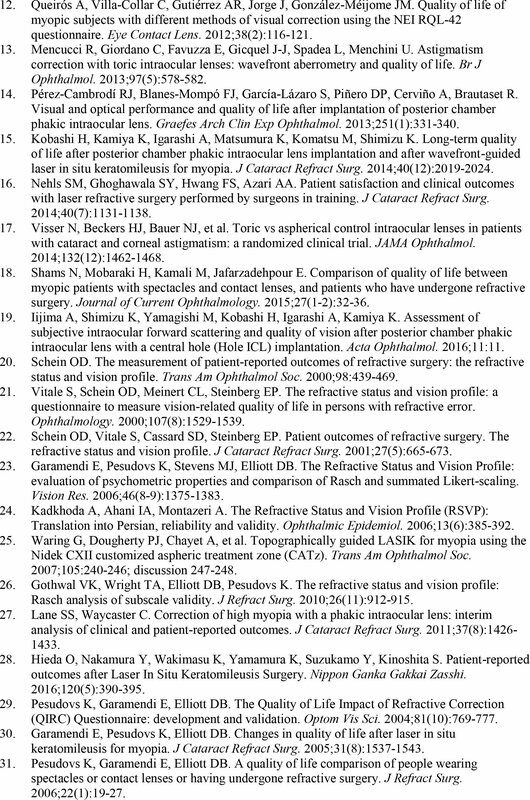 We identified 81 articles describing 27 questionnaires (12 refractive; 15 non-refractive questionnaires: 7 vision-but-non-refractive, and 8 generic). (Refer to Table C, available in the online version of this article, for a complete list of articles by the types of questionnaire they describe.) 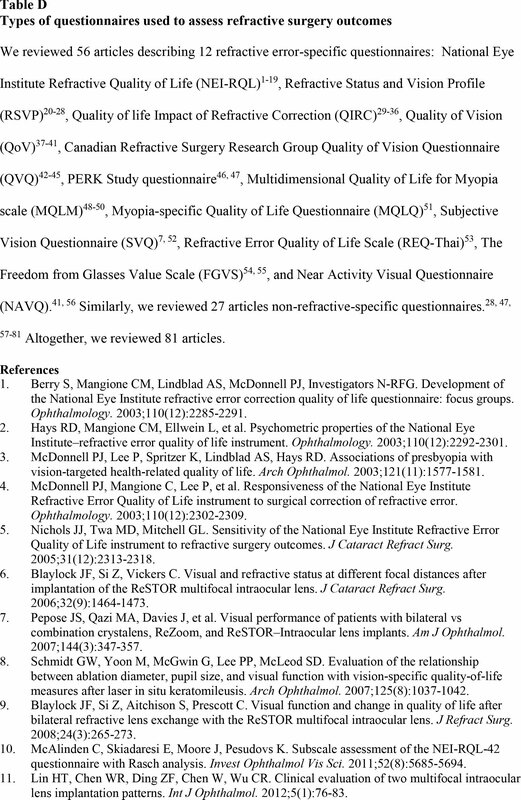 Most articles (n = 56, 69.1%) described use of questionnaires specific to refractive error. 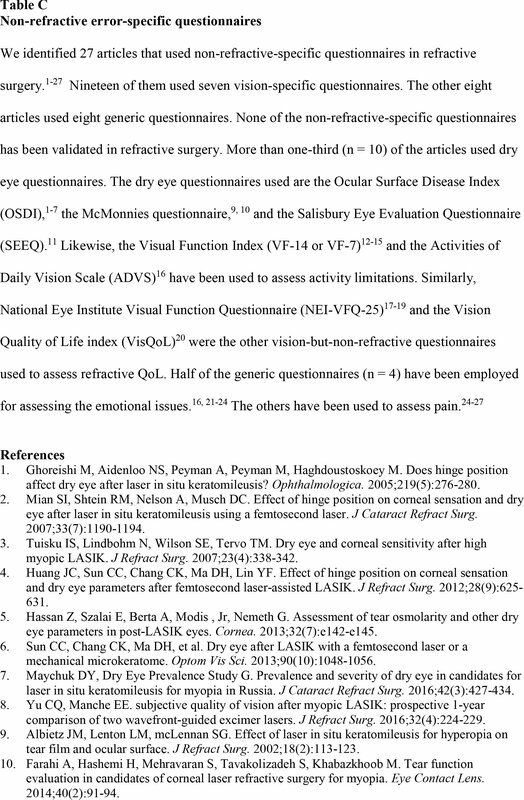 Others used vision-but-non-refractive (n = 19, 23.5%) and generic (n = 8, 9.9%) questionnaires (Table D, available in the online version of this article). Two articles described more than one type of questionnaire (Figure 1). None of the non-refractive questionnaires were validated in refractive surgery populations. 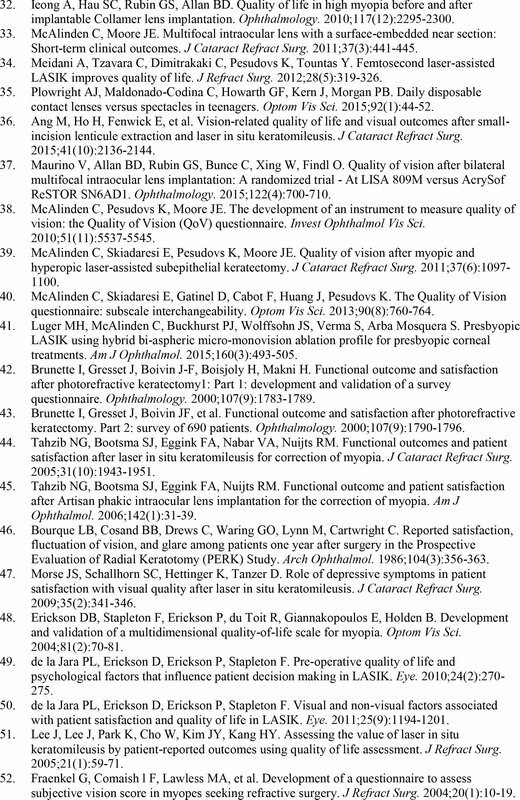 We reviewed 56 articles describing development, validation, or application of 12 questionnaires specific to refractive error (Table B). Three questionnaires were developed using Rasch analysis,17–19 and four questionnaires were developed exclusively for refractive surgery.25–28 We extracted information on properties of the questionnaires (frequency of use, concept measured, content development, and scoring), test performance (tests based on CTT or Rasch analysis for assessing psychometric properties, validity, and reliability), and performance of the questionnaire as an outcome measure (eg, responsiveness or sensitivity to the effect of complications). Then the questionnaires were assessed for quality (Table B). If the information on assessment criteria (Table A) is not provided below or in Table B, then either the test was not performed or the information was not provided. McAlinden et al.43 reported that all subscales of the NEI-RQL failed to form valid scales when assessed with Rasch analysis (Table B). Similarly, Blaylock et al.44 found no significant correlation between postoperative refractive error with all NEI-RQL scores. In another study, Iijima et al.45 found moderate correlation (Spearman's correlation coefficient = 0.58) between glare subscale score and scattering from phakic IOL with a central hole (hole ICL). In general, studies have found better NEI-RQL scores for refractive surgery compared to spectacles or contact lens wear.21,46–49 However, many studies have reported poorer glare subscale scores after refractive surgery.21,48,50,51 The NEI-RQL has been used to compare refractive quality of life in refractive surgical populations. Nichols et al.52 reported significant differences only for 4 of 13 subscale scores between patients with myopia seeking LASIK and patients with myopia not seeking LASIK. 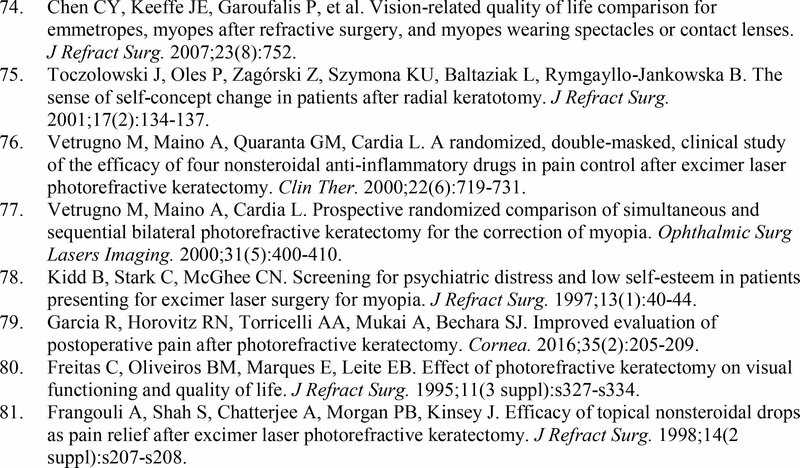 McDonnell et al.50 reported similar changes in NEI-RQL scores after keratorefractive surgery for patients with myopia and hyperopia, whereas Blaylock et al.51 reported larger improvement in 2 of 13 subscale scores in patients with hyperopia compared to patients with myopia. The RSVP has been used as an outcome measure in various types of refractive surgery, including LASIK60 and phakic IOL implantation.61 Schein et al.62 reported that the RSVP is responsive to quality of life changes after refractive surgery (effect size: 1.2 to 1.4). Most patients had significant improvements in overall scale and 2 of 8 subscales. Similarly, Lane and Waycaster61 reported moderate responsiveness of the overall RSVP for phakic IOL implantation for high myopia. 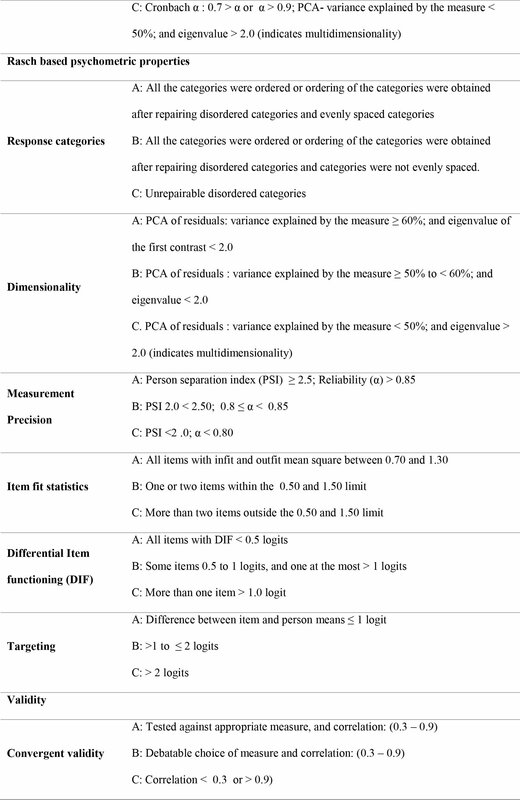 The overall effect size value was 0.8 at three postoperative assessments. The effect size for individual subscales ranged from 0.3 to 1.4.61 Similar to the NEI-RQL, the performance of the RSVP in measuring refractive surgery outcomes is inconsistent in the literature. The QIRC has been reported to be responsive to different refractive surgery procedures, including LASIK, LASEK, implantable collamer lens (ICL) implantation, multifocal IOL implantation, and SMILE.17,63–69 In a study by Garamendi et al.,66 the QIRC was responsive to detect change in quality of life after LASIK. Improvement in the scores was observed for all 20 items, of which 16 were statistically significant. Only a small number of patients who had complications had decreased QIRC scores.66 McAlinden and Moore69 and Ieong et al.68 reported improvement in the QIRC score after multifocal IOL implantation and ICL implantation, respectively. Similarly, using the Greek version of the QIRC, Meidani et al.63 found that femtosecond laser–assisted LASIK significantly improves quality of life. Ang et al.64 found no differences between the QIRC scores 3 months after LASIK and SMILE. However, the authors indicated that a study with a larger sample size and a longer follow-up period is required to confirm their findings.64 In another study, Pesudovs et al.65 found that the patients who had refractive surgery had higher QIRC quality of life scores than those who wore spectacles or contact lenses. Likewise, Ieong et al.67 reported higher QIRC quality of life scores for ICL implantation over contact lens wear. To conclude, the QIRC has been proven responsive to changes in refractive surgery outcomes (including complications) and it enables comparison between effectiveness of the newer surgical procedures. Visual symptoms are an important potential complication of refractive surgery.8–12 The QoV has been used to assess symptoms after various types of refractive surgical procedures. McAlinden et al.71 reported worsening of symptoms after LASEK, which subsequently improved to better than the preoperative levels by 3 months postoperatively. Luger et al.72 reported that the QoV scores worsened after presbyopic LASIK before 3 months and remained stable after that. In another study, Maurino et al.73 reported no significant difference between the QoV scores between two types of multifocal IOL implantation (bilateral implantation with the AT LISA 809M IOL or ReSTOR SN6AD1 IOL). A small but clinically significant minority of patients remained symptomatic (particularly halo being more bothersome).73 The QoV performs satisfactorily as an outcome measure in refractive surgery. 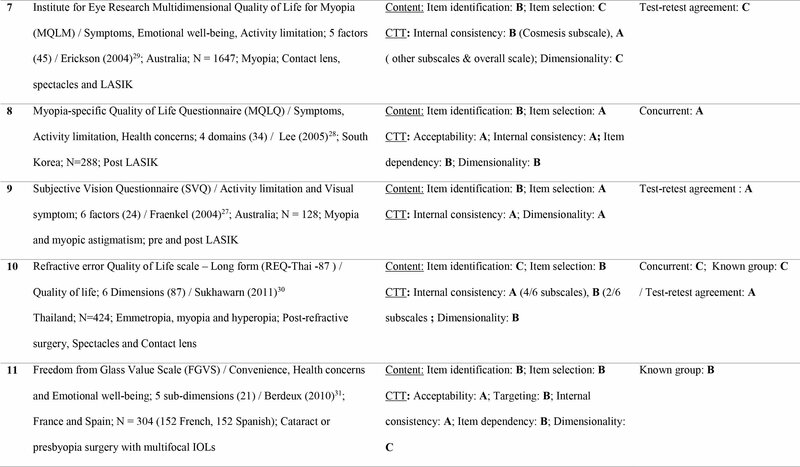 The REQ-Thai is a CTT-based questionnaire developed to assess refractive-specific quality of life and refractive surgical outcomes in Thai adults.30 The items were obtained from the literature. The original version has 87 items and the new version has 48 items. The REQ-Thai has not been used as an outcome measure. The FGVS is a CTT-based questionnaire that aims to assess freedom from glasses after multifocal IOL implantation.31,32 It consists of items on health concerns, convenience, and emotional issues. Scores for each item range from 1 to 5, with a higher score meaning a more positive evaluation. 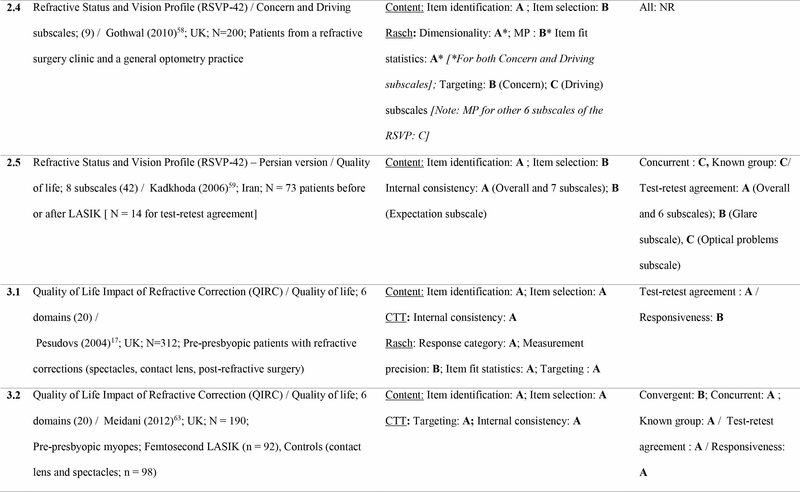 The NAVQ was developed to assess outcomes of presbyopic corrections, including various IOLs.19,72 All items are related to activity limitations. The content was developed mostly from the literature.19 The NAVQ has been evaluated using Rasch analysis and CTT. Raw scores are converted to the Rasch scale with higher scores indicating worse visual function. 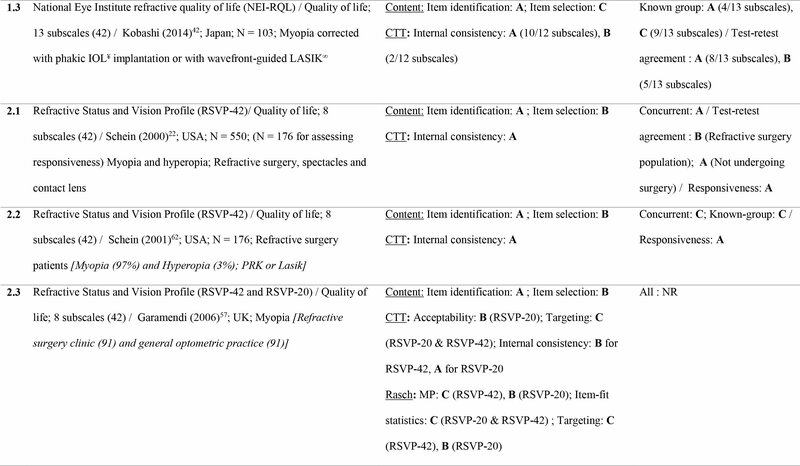 We systematically assessed the quality of the questionnaires (n = 12) validated in refractive surgery (Table B). The QoV18 (grades: 8 As, 2 Bs), the QIRC17 (grades: 7 As, 2 Bs), and the NAVQ19 (grades: 5 As, 3 Bs) are the three best available questionnaires in refractive surgery to assess visual symptoms, quality of life, and activity limitations, respectively (Table B). In this review, we comprehensively assessed the quality of all questionnaires based on both CTT and Rasch analysis. Most, including the most frequently used questionnaires (the NEI-RQL and the RSVP), were developed using CTT. Similarly, the questionnaires for measuring quality of life exclusively in refractive surgery (the PERK Study Questionnaire, MQLQ, QVQ, and SVQ) were developed using CTT. The questionnaires developed by CTT provide only the elementary information on psychometrics, validity, and reliability.8,36,37 The NEI-RQL and RSVP were found to be invalid measures when evaluated by Rasch analysis.43,57,58 An attempt to revise the NEI-RQL using Rasch analysis was unsuccessful.43 An attempt to revise the RSVP using Rasch analysis was more successful, although only 2 of 8 subscales were functional and this revised version has not been assessed in outcomes studies.57,58 Despite this, the NEI-RQL and the original RSVP are still being commonly used. The inconsistency in the findings of various studies that have used the RSVP and NEI-RQL probably reflects their poor psychometric properties. The questionnaires developed by the Rasch analysis (QoV, QIRC, and NAVQ) are of superior quality. This is in agreement with the literature that demonstrates that the questionnaires developed or rescaled using Rasch analysis produce better quality scales than those by CTT.8,36,37,39,63 This is probably because Rasch analysis can identify critical shortcomings and provides opportunity to improve them in a questionnaire. However, even these best questionnaires have limitations. The 20-item QIRC has been reported to be multidimensional, and was split into two unidimensional scales.64 The QoV suffered from poor targeting and differential item functioning.18 The NAVQ had poor item-fit statistics and poor targeting. The dimensionality of the NAVQ has not been reported yet19 (Table B). The popularity of refractive surgery is growing.4,5 Newer procedures claim to be better. However, quality of life benefits from the newer treatment procedures should be demonstrated.8,16,66 The importance of questionnaires is indisputable for ongoing evaluation of the new technological procedures.8,16,66 From the results of this review, it is evident that the questionnaires may be sensitive to assess the effect of complications on quality of life. However, clinicians and researchers should be careful in choosing a questionnaire. It should be done based on the concept being measured and the quality of the questionnaire, not on the frequency of use or reputation of the developers.37,39 The studies have explored the outcome of refractive surgeries up to 5 years postoperatively. The usefulness of questionnaires in assessing longer-term postoperative outcomes is yet to be studied. Based on our quality assessment criteria, we recommend the higher quality questionnaires for use. The QoV is the most appropriate questionnaire to assess visual symptoms. The QIRC is the recommended questionnaire to assess quality of life. Similarly, the NAVQ is recommended to measure activity limitation in presbyopia. Pesudovs K. Item banking: a generational change in patient-reported outcome measurement. Optom Vis Sci. 2010;87:285–293. Schein OD. The measurement of patient-reported outcomes of refractive surgery: the refractive status and vision profile. Trans Am Ophthalmol Soc. 2000;98:439–469. Fraenkel G, Comaish lF, Lawless MA, et al. 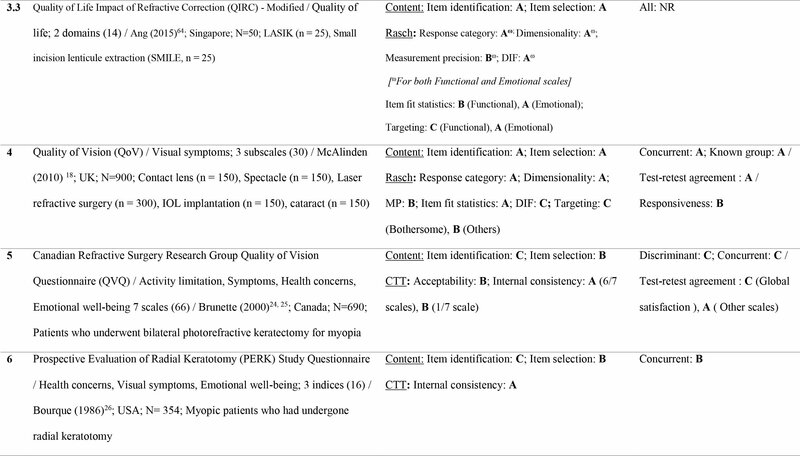 Development of a questionnaire to assess subjective vision score in myopes seeking refractive surgery. J Refract Surg. 2004;20:10–19. Lee J, Lee J, Park K, Cho W, Kim JY, Kang HY. Assessing the value of laser in situ keratomileusis by patient-reported outcomes using quality of life assessment. J Refract Surg. 2005;21:59–71. Sukhawarn R, Wiratchai N, Tatsanavivat P, et al. Development of a refractive error quality of life scale for Thai adults (the REQ-Thai). J Med Assoc Thai. 2011;94:978–984. Frangouli A, Shah S, Chatterjee A, Morgan PB, Kinsey J. Efficacy of topical nonsteroidal drops as pain relief after excimer laser photorefractive keratectomy. J Refract Surg. 1998;14:S207–S208. Blaylock JF, Si Z, Aitchison S, Prescott C. Visual function and change in quality of life after bilateral refractive lens exchange with the ReSTOR multifocal intraocular lens. J Refract Surg. 2008;24:265–273. Lin HT, Chen WR, Ding ZF, Chen W, Wu CR. Clinical evaluation of two multifocal intraocular lens implantation patterns. Int J Ophthalmol. 2012;5:76–83. Pesudovs K, Garamendi E, Elliott DB. A quality of life comparison of people wearing spectacles or contact lenses or having undergone refractive surgery. J Refract Surg. 2006;22:19–27. 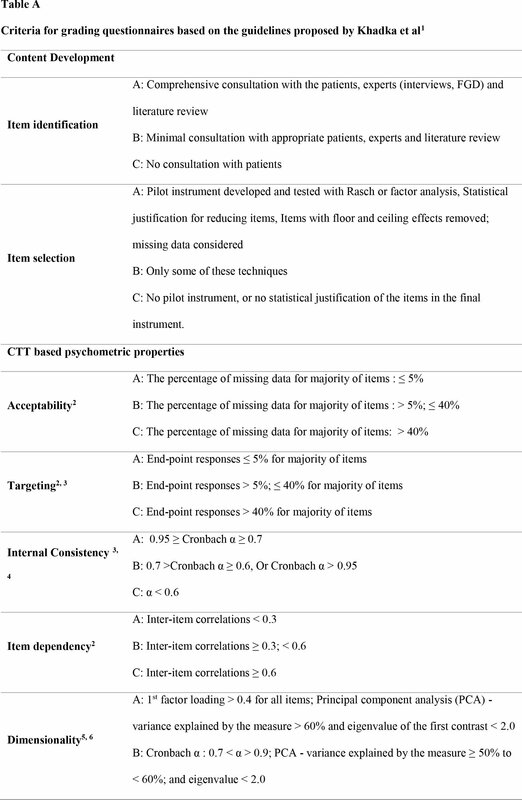 Item selection A: Pilot instrument developed and tested with Rasch or factor analysis, Statistical justification for reducing items, Items with floor and ceiling effects removed; missing data considered B: Only some of these techniques C: No pilot instrument, or no statistical justification of the items in the final instrument. 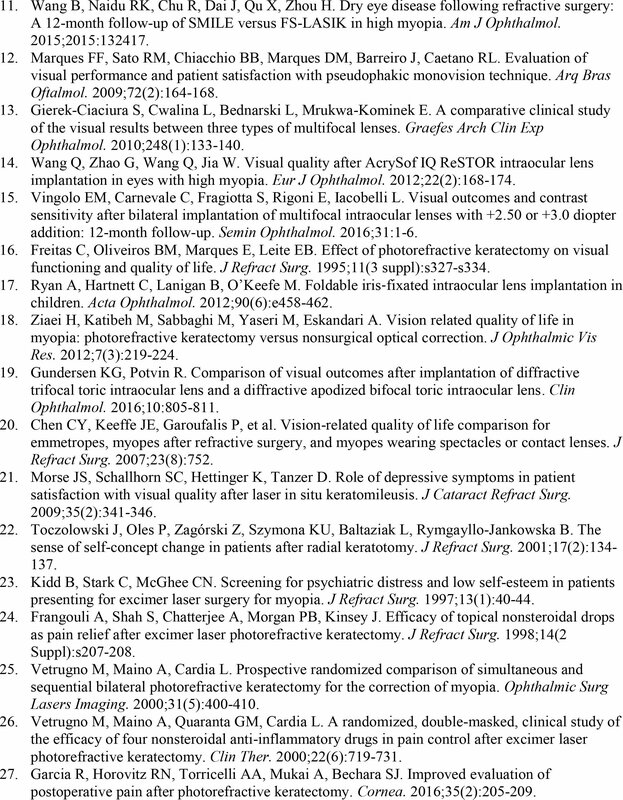 We reviewed 56 articles describing 12 refractive error-specific questionnaires: National Eye Institute Refractive Quality of Life (NEI-RQL)1–19, Refractive Status and Vision Profile (RSVP)20–28, Quality of life Impact of Refractive Correction (QIRC)29–36, Quality of Vision (QoV)37–41, Canadian Refractive Surgery Research Group Quality of Vision Questionnaire (QVQ)42–45, PERK Study questionnaire46, 47, Multidimensional Quality of Life for Myopia scale (MQLM)48–50, Myopia-specific Quality of Life Questionnaire (MQLQ)51, Subjective Vision Questionnaire (SVQ)7, 52, Refractive Error Quality of Life Scale (REQ-Thai)53, The Freedom from Glasses Value Scale (FGVS)54, 55, and Near Activity Visual Questionnaire (NAVQ).41, 56 Similarly, we reviewed 27 articles non-refractive-specific questionnaires.28, 47, 57–81 Altogether, we reviewed 81 articles. From the NHMRC Centre for Clinical Eye Research, Flinders University, Adelaide, Australia (HK, JK, KP); the Department of Clinical Sciences, Ophthalmology, Faculty of Medicine, Lund University, Sweden (ML); and the University of Adelaide/South Australian Institute of Ophthalmology, Queen Elizabeth Hospital, Adelaide, Australia (MG). Supported by the NHMRC (1031838) and the Australian Government Research Training Program Scholarship.